We provide conservative, mainstream chiropractic care. What do we mean by “conservative” chiropractic care? Conservative means providing medically necessary chiropractic care to patients without sales pressure, long-term recommendations, or unnecessary therapies. It also means working in conjunction with other healthcare providers, including the patient’s medical physician. What do we mean by “mainstream” chiropractic care? We mean providing the kind of care most patients want when they visit a chiropractor—safe, effective relief for neck and back pain. How do we know that is what most patients want? 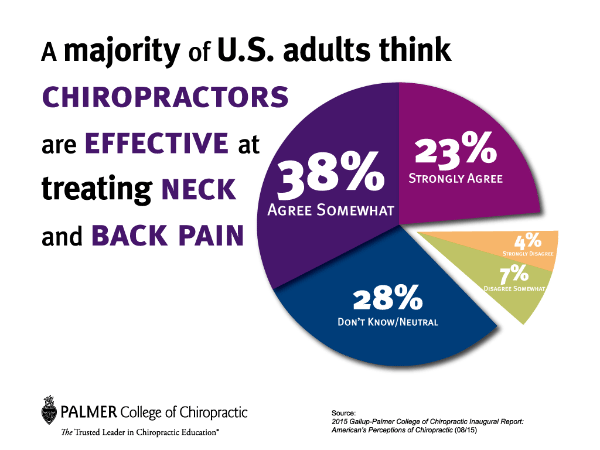 According to a recent Gallup report commissioned by Palmer College of Chiropractic, two-thirds (61 percent) of U.S. adults believe chiropractic doctors are effective at treating neck and back pain. That does NOT necessarily mean that most people think chiropractic care is effective for other complaints. Is chiropractic effective for other complaints? Maybe. Sometimes. But chiropractors have extensive training and clinical experience in dealing with the non-surgical management of patients with neck and back pain. That is why the majority (57 percent) of adults are likely to see a chiropractor for neck or back pain. The Gallup report went on to say that more than 1/2 of all U.S. adults have visited a chiropractor—that means chiropractic care for neck and back pain is mainstream. In fact, 33.6 million U.S. adults (14 percent) seek chiropractic care each year. We are dedicated to providing the best conservative, mainstream chiropractic care to patients without sales pressure, long-term recommendations, or unnecessary therapies. Because we know that patients have busy lives, we give patients the flexibility of being seen without an appointment, and the ability to stop or resume care on their terms. We are also receptive to working in conjunction with other healthcare providers, including the patient’s medical physician. If all of this sounds like the kind of chiropractic care you have been looking for, call or contact our office today.